The challenge for the next generation of journalists will be to adapt data and computational science to reporting and storytelling while upholding the profession’s core journalistic mission. To that end, this data journalism series focuses on the themes covered in the M.S. in Data Journalism program, which aims to provide future journalists with an understanding that goes well beyond data journalism fundamentals and offers an advanced graduate-level curriculum that includes data, computation and innovation classes. In this installment from our data journalism series, we revisit Muck, an ambitious build tool for data analysis projects that makes it easier to create reproducible projects with clean data and comprehensible code, all while allowing for iterative data transformations and expansions to data sets. Veracity and reproducibility are vital qualities for any data journalism project. As computational investigations become more complex and time consuming, the effort required to maintain correctness of code and conclusions increases dramatically. This report presents Muck, a new tool for organizing and reliably reproducing data computations. Muck is a command line program that plays the role of the build system in traditional software development, except that instead of being used to compile code into executable applications, it runs data processing scripts to produce output documents (e.g., data visualizations or tables of statistical results). In essence, it automates the task of executing a series of computational steps to produce an updated product. The system supports a variety of languages, formats, and tools, and draws upon well-established Unix software conventions. A great deal of data journalism work can be characterized as a process of deriving data from original sources. Muck models such work as a graph of computational steps and uses this model to update results efficiently whenever the inputs or code change. This algorithmic approach relieves programmers from having to constantly worry about the dependency relationships between various parts of a project. At the same time, Muck encourages programmers to organize their code into modular scripts, which can make the code more readable for a collaborating group. The system relies on a naming convention to connect scripts to their outputs, and automatically infers the dependency graph from these implied relationships. Thus, unlike more traditional build systems, Muck requires no configuration files, which makes altering the structure of a project less onerous. Muck’s development was motivated by conversations with working data journalists and students. This report describes the rationale for building a new tool, its compelling features, and preliminary experience testing it with several demonstration projects. Muck has proven successful for a variety of use cases, but work remains to be done on documentation, compatibility, and testing. The long-term goal of the project is to provide a simple, language-agnostic tool that allows journalists to better develop and maintain ambitious data projects. Building completely reproducible data journalism projects from scratch is difficult, primarily because of messy input data. Practitioners often have to take many steps to clean data, and may use a variety of computational tools in a single project. Muck effectively solves this problem by formalizing the step-by-step approach in a way that aids, rather than hinders, the programmer. The system is language-agnostic and encourages the programmer to break down their complex data processing problems into well-named constituent parts, which can then be solved piece by piece. The resulting code structure clearly describes the relationships between parts, which improves the clarity of the solution. Not all data cleaning tasks can be clearly expressed as code. In particular, there is a class of “one-off” corrections like missing commas and correcting obvious outliers for which programmatic solutions appear very cryptic upon review. Muck provides a mechanism for capturing and reproducing manual edits to data files as “patches,” which is crucial for cases where automated approaches are ineffective. Patching techniques are particularly compelling for journalism because so many original data sources are very messy. Furthermore, the approach may offer a means by which non-programmers can efficiently contribute to a substantial data cleaning job, while maintaining the automated reproducibility of the overall project. A new system for professionals needs to be compatible with the wide range of existing tools that practitioners know and trust. In practice, no program can be all things to all people. Unlike data tools that present non-programmers with graphical interfaces, Muck is a command line tool developed specifically for programmers who are already familiar with one or more languages, as well as Unix operating system fundamentals. This makes Muck unsuitable for complete beginner’s, but also means that it is much more easily integrated into professional environments. 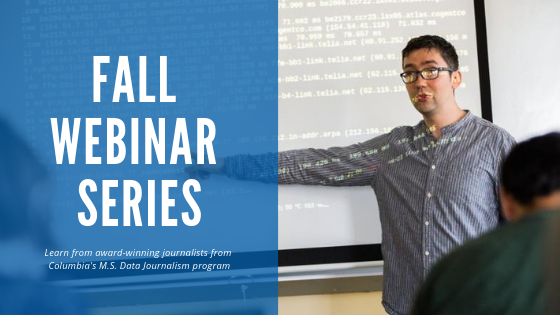 Learn more about the School's Data Journalism Webinars hosted by award-winning faculty and experts.